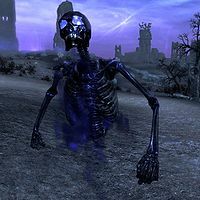 Mistmen are floating, ghostly undead found within the Soul Cairn. Mistmen are the mages of the Soul Cairn, as opposed to the warrior-like wrathmen and the lightly-armed bonemen. Mistmen have the ability to cast Frostbite and Ice Spike, though they will resort to punching when they run out of magicka. A Conjuration spell tome Conjure Mistman can be found in the Soul Cairn, which summons a mistman for 60 seconds. The powerful dragon Durnehviir is also able to summon mistmen, alongside wrathmen and bonemen. This page was last modified on 21 November 2018, at 15:18.